New Listing – When you walk through the door to this property you won’t believe your eyes, this apartment has the WOW factor which will help you to enjoy your holiday on the Costa Blanca. 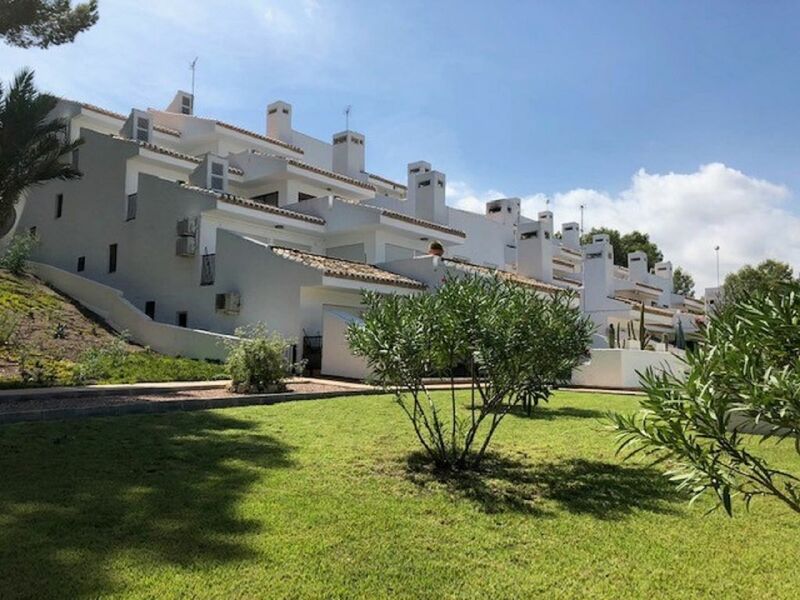 The property consists of the open plan newly updated kitchen with all of the equipment you should need if you plan to cook indoors or eat al fresco on one of the terraces overlooking Villamartin Golf Course and the communal pool. The kitchen is equipped with all the usual necessities including hob & oven, fridge freezer, microwave and washing machine. The property has everything you will need to enjoy your holiday, English TV, free Wi-Fi and access to movie and sports channels. Air conditioning, iron & ironing board, hairdryer and beach towels are also included. The dining area is elevated, again surrounded by large windows overlooking the communal pool, there is an extendable table which will seat 6 should you need it. There is a door from the lounge that leads to the first toilet following on you will find a lovely modern bathroom with a his and hers sink and a walk in shower all newly refurbished. The first bedroom is the twin room which has 2 single beds, fitted wardrobes and air conditioning, the patio doors in this bedroom lead to the patio so you can just step outside in the sunshine when you wake up. The main bedroom is spacious a beautifully furnished again with fitted wardrobes and air conditioning together with lots of drawer space, again you can access the terrace from your bedroom. You will find 2 single zip linked beds that can convert to a double. The property has everything you will need to enjoy your holiday, English TV, wi-fi, air conditioning iron & ironing board, hairdryer and beach towels. Once out on the terraces you will find a built in seating area with cushions on, one where you can watch the golfers and enjoy the afternoon and evening sunshine. On the other terrace you will find a BBQ and a dining area should you want to eat outside. There is also access to sun loungers to use on the terrace or by the pool. A couple of hundred meters away you will reach the Rioja Commercial center where you will find restaurants and bars, 100 hundred meters further on you will have reached Los Dolces Commercial center where you will also find a supermarket. It will take you approx. 10-15 minutes to walk to Villamartin Plaza should you want to. There are many golf courses in the area, the closest being Campo de Golf Villamartin, which is a 5 minute drive or Las Ramblas, Las Colinas, Campoamor and La Finca which are all within a 20 minute drive. Why not take out the hassel of bringing your golf clubs and just use one of the local hire companies. Online tee times are available to enable you to plan your activities before you set off on your holiday. La Zenia beach is approximately a 7 minute drive where you will find a beach bar and restaurant with sun loungers and parasols for hire. Most of the beaches in the area have good facilities so try them all and find the best one for you. At Mil Palmeras they have inflatables in the sea. Zenia Boulevard offers you a shoppers’ paradise where you can shop until you drop and then maybe stop for a bite to eat in the dedicated food hall or a snack at a tapas bar in the center. Zenia Boulevard is open from 10.00 in the morning until 10.00 at night, the day and evening experiences are quite different but equally as good. €70 is payable on arrival for clean & laundry paid on arrival. Arrival is after 2.00pm and departure before 10.00am unless other arrangements have been made. Welcome packs can be arranged. I am the Property Manager for this apartment, we look after a number of properties in the area should you need more than one apartment for you and your family and friends please let me know. This is truly the best view you’re going to wake up to in this area, the apartment is spacious well kitted out and very comfortable. If you can be bothered to cook, you’ve got all the kit and the supermarket is ten minutes walk away. Lidl is a bit further, a twenty minute walk and a short taxi ride back; but hey your on holiday, within five minutes you’ve got excellent (and very reasonable) Chinese (yum), Italian and Indian (both super yum). This may be a bit out of the way, but if you’ve got transportation or a not scared of walking this apartment is excellent. This was a beautiful clean & spacious apartment. Well stocked with kitchen crockery & utensils, everything needed to rustle up that laid back breakfast or even that evening meal. Beautiful pool which we had to ourselves throughout our stay. Gorgeous views over the golf course provided the lovely tranquil setting. Would have no qualms recommending this as a lovely peaceful holiday setting. Thank you so much for taking the time to write a review on our property, we are so glad you enjoyed our property and look forward to seeing you again in the future. Clean and modern apartment overlooking the pool onto the Villamartin Golf course. Very secure and with everything needed for a long or short stay. Hosts very accommodating. Thank you for taking the time to write a review, we are glad you enjoyed your holiday and hope to see you again. First of all the photos do not do the apartment or location justice, it's much much better ! Really nice location 10 mins walk from Villamartin Plaza and less than 10 mins drive to the huge shopping mall. A great location for exploring the area with easy access to pretty much everything. About 40 mins drive from Alicante airport. The apartment is larger than normal, lots of space inside and outside, set in the pine trees and with great views of the golf course. The pool is communal, but looked large enough to be comfortable (didn't use as not warm enough). Thank you for taking the time to write a review, we are so glad you enjoyed the property and location. We look forward to seeing you at one of our properties again in the future. Enjoyed our stay in this lovely apartment, great views and good location. Quiet but easy access to amenities. villamartin plaza 5 minutes by car or 5 euro taxi ride. Walkable if you are young and fit, a bit far for us oldies. Walkable to nearest Centre with bar restaurant and supermarket. Short drive to larger supermarkets and la zenia mall and beach. Good location for exploring further afield we went north as far as Denia and south as far as Vera. Motorways empty but tolls, 'A' roads free but busier. Problem with TV couldn't access channels as the box needed updating although Kevin and Sharon came out the first night and Kevin came back a couple of times after that even lending us his own box. Recommend you bring dvds although the remote control didn't work. Apartment is north facing so no sun on the balcony, at least in winter maybe ok in summer when sun is higher also apartments are tiered. Pool in sun all day and quiet, we were the only ones using it. Pool shared with the 16 apartments but most are holiday homes appeared to be maybe 5 or 6 occupied when we were there. Had to carry the sunbeds down to the pool and back each day but communal tables and chairs around the pool. Good security, gates to each set of 8 apartments and to each property. Quite a lot of stairs down to the property as it's built on a hill so may not suit everyone. Otherwise home from home, we would recommend it and would stay here again if we come back to this area. Thank you for taking the time to write a review, I am glad you had a good holiday and hope to see you again in the future. As we walked through the doors to this property we did get the wow ! The property was modern, bright and very clean with lots of space to kick back and relax. Plenty of storage space is provided and all the facilities you could need for a relaxing holiday, even down to the paella dish ! Beds are also comfortable. Agree with the previous review, whilst there is access to an additional fridge, the property could do with access to a freezer ! Didnt watch too much TV but access to films, sports and English TV is always welcome when you don't feel like venturing out. The views over the pool and golf course are excellent and you can sit back relax whilst hearing a thwack, a shout of fore ! Or listen to distant chatter or the sprinkle of water whilst the greenkeepers go about there work, all nice and reassuring really. A visit to Ellie's bar at la Rioja will make sure you are suitably fed and watered with an endless amount of Tapas, some of it complimentary. Other local bars and restaurants were tested and the odd visit to the plaza didn't disappoint. We will definitely be returning ! Thank you for taking the time to write a review of our property, we are so glad you had a good holiday. We have spoken to the owners with reference the freezer and I am happy to say that a further freezer has been purchased for the property, so now it has everything you need to enjoy your next holiday. We look forward to seeing you at a Gleam Team Rental property in the future. More details on the area surrounding this property will be sent on to you in our "Welcome Pack".